Publisher(s): Sears, Roebuck and Co.
10-14-2012 exonerator Box Text Your spaceship is trapped in a deadly asteroid belt. You will have to destroy the drifting asteroid boulders before they destroy your spaceship. But, watch out for enemy spacecraft. Fire your missiles to destroy the boulders and the enemy. 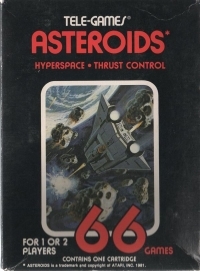 This is a list of VGCollect users who have Asteroids (64 Tele-Games) in their Collection. 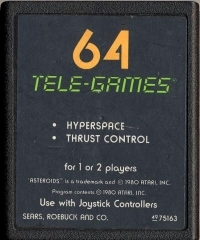 This is a list of VGCollect users who have Asteroids (64 Tele-Games) in their Sell List. 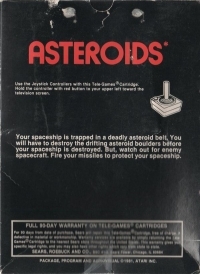 This is a list of VGCollect users who have Asteroids (64 Tele-Games) in their Wish List.